What hopes to be the final form of an innovative new grocery shopping aid device using Windows CE will go into beta this spring, with a possible nationwide rollout by the end of the year. NEW YORK CITY (BetaNews) - A pilot program in New Jersey testing the efficiency and viability of computers with scanners and touch-sensitive panels embedded in shopping carts, may finally draw to a close in 2008 after four years in the field. At the annual National Retail Federation conference here, the privately held MediaCart holdings unveiled what it hopes will be the final design of its in-cart computer, which features aisle-specific advertising, a wealth of convenience features for shoppers, and one more venue for Microsoft Windows. "This cart will let you know where it is, where it's been, and what's in it," Marty Ramos, Microsoft's retail solutions specialists, told BetaNews this afternoon. It will also know who you are, we learned today, by virtue of those customer loyalty cards that nearly every major grocery chain in the country now utilizes. Using the on-cart scanner, you essentially "log on" to the grocery store the moment after you grab your cart. From there, a tilt-able touch screen device -- which has moved to the nose of the shopping cart from the handle, in its current incarnation -- communicates with the shopper, as a SQL Server-endowed system in the back office pulls up the history of whatever the shopper has purchased in the past. Rather than using expensive Wi-Fi locators, the MediaCart system uses an inexpensive RFID tag that's triggered by sensors in each aisle. Once the cart knows where it is, it can serve advertising to the shopper that's specific to the items for sale on that aisle. And since the system has also retrieved the shopper's history, it can offer specials or coupons to that shopper based on what he's likely to be purchasing this time around. The RFID device MediaCart uses is supplied by Cambridge, Massachusetts-based ThingMagic, we were told today by MediaCart VP for Systems Integration Ed Gross; and it uses Cisco's Unified Wireless Network on the back end. Though the pilot systems up to now have been running Windows XP, the company's intent is to move the final production units to Windows CE 6.0. The Microsoft-powered system beat out an alternative platform being developed with IBM, Gross said. That system was probably Cuesol's "Cart Companion," which employed a system IBM was developing in 2005 called "Shopping Buddy." Perhaps the most convenient and innovative feature of the MediaCart device, as MediaCart Holdings CEO David Brice demonstrated for us, is its own little mobile self-service kiosk. 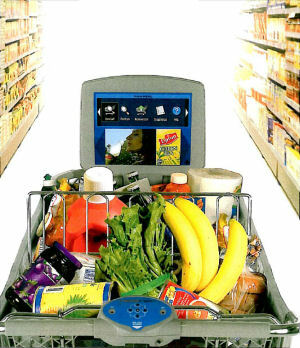 Since there's a scanner device under the handle of the cart, a shopper can scan items for purchase as she's carting them. She can see a running subtotal on the screen as she's shopping. Then at checkout time, all she has to do is wave her payment card at the back-end gateway, since both the cart and the back-end system already know what the cart contains, in a move that could eliminate the waiting time in line altogether no matter how busy the store is on any given day. Since the system uses advertising, MediaCart plans to make its system easier for stores to implement by subsidizing part or all of the installation itself, eating those costs up-front. Its business model is based on revenue from advertisers, not stores. Up to now, ShopRite stores in New Jersey have been the exclusive center of MediaCart's pilot program, though a partnership with the chain's parent, Wakefurn Foods Corp. Now, the pilot will be extended not only to the rest of the US, but to Southeast Asia and Europe, CEO Brice told BetaNews today. The final stage of the pilot program, BetaNews was told, should begin this spring, with the aim to roll out production models by the end of the year. But back in June 2007, however, MediaCart officials told CNBC they'd hoped to conclude their pilot projects by the end of that year.